more to a rare topic. Taking this into account, it is time to start thinking about future social scenarios and models. Let us hope that the related discussion takes place prior to the Swiss poll in early June where Swiss people can express their opinion on the “unconditional income” according to which each person in Switzerland will have a base salary independent of their professional status. It would be highly dangerous to only reduce this discussion to the normal ideological fights between the established political parties in ­Switzerland. logies (see article on page 2 of this issue). To support all these activities, the company has decided to expand its executive board to include 3 persons. Fabian Rezzonico started his new role as CTO on Januar y 1 st 2016 while still being member of the board of directors. The presidency of the board has been transferred to Matthias Miescher, who is member of the board already since the beginning of 2014.
panies, we can provide all necessary services and products to satisfy today’s customer’s needs. Working closely together among the IT partners, the customer enjoys a single point of contact to deal with. Quality and reliability are no less than what can be expected from any other provider. Additionally, supporting local companies also makes a statement in favor of the region Solothurn and the development of it’s labor market. We will be inviting existing as well as prospect customer from within the region. This will also make for a good networking platform. Would you like to know more about the event and the local initiative? Please contact us on sales@intersys.ch or call on 032 625 76 76 for further information. Digitalization of the econony – is your company ready for the future? Digitalization is THE hot topic in today’s economy. Companies are pushing to perform the necessary changes in order to align their traditional business to the new realities, making sure their position in the market will stay or even expand. Companies and public offices generally have t wo areas where digit alization ­m atters the most: –	The complete service portfolio of the organisation needs to be digitized. This means: enabling of existing services and products with IT capabilities. This will reduce the cost of the products and services and extend their reach to new potential customers that have not been addressed before. New products are designed with this new reality in mind which will allow for new, prospective business models. –	Helping to make sure legal compliance is achieved thus reducing risks for the organisation Intersys main focus centers on supporting companies optimizing their processes and products. With the addition of an ECM (Enterprise Content Management) product to its portfolio, Intersys can offer each customer a key component in order to find the optimal start into the world of d ­ igitalization. ECM deals with the creation, the management, the long term storage and the provisioning of a company’s Information base. Additional information regarding the Intersys ECM portfolio can be found on our ECM-Website. Email archiving from the mail inbox of a user is considered standard in today’s archiving solutions. There is also the possibility to archive mails right from the mail server using business rules and automated text recognition. Intersys is your specialist for integration of all of these document sources and offers a set of related services supporting your efforts. Aiming at a high degree of automation right from the start will make sure that your investment is spent wisely and will also protect money invested (e.g. through migration). The Intersys ECM system offers the most advanced mail archiving client that will plug in right with Microsoft’s Exchange Servers, be it on premise or in the cloud. Using these mechanisms, your company can save on work efforts and raise the overall employee satisfaction while being compliant with legal requirements. Find out more from ­I ntersys. ECM Starter Kit Building up and getting a digital archive into operations should be cost effective and straight for ward these days. For this purpose, Intersys has introduced a starter kit, which will facilitate the basic installation, targeting small to medium sized companies. The kit contains all necessary components to support a company with its needs: –	The necessary archive license, the integration into Microsoft Office based documents, email archiving and web access to the archive –	The necessary services to install the system on the customers premise or in a outsourcing center Ask for our pricing and the optimal setting for your company. ECM and Collaboration Up to date electronic archiving systems today have built in mechanisms to support collaboration among the various stakeholders of a company. No need for information workers to send mails forth and back to update on relevant changes in the archive. This automatically results in less mail traffic. Today’s digital archives are far more than just filers. They support efficient and fast handling of information that is used in everyday work situations. Introducing the project management and solution architecture team When is the time a PM is happy with his work? Whenever the customer is happy. Personally, I’m very happy if I meet the three main goals of a project: cost, quality and time. Additionally, it is also important to me keeping the load on my team at an acceptable and sustainable level. To the benefit of everyone involved. important to have a clear change procedure that will be applied. No need to state that the main challenge of a software project is meeting cost, time and quality targets at all times. What established PM methods are in use in your company? Depending on customer’s choice, we are using the classical waterfall method or the newer, agile development. Classic methods are used for instance with telco operators where the resulting systems are mission critical and need to run at all times. Upgrade times of such systems are very short, typically 2–3 times a year. Those customer’s internal processes are still very much focused on the waterfall method so we easily adapt to them. As project controlling method, we are using the so called “Earned Value Analysis (EVA). With this method, simply stated, we have a mean of regularly measuring project progress on the time and cost axes and we are also able to project the project targets on these axes. Regarding agile development methods: One of the big advantages of the agile framework lies in the fact, that customer requirements and actual development results can be compared, adjusted and reprioritized at the end of each sprint, which is typically ever y two to four weeks. This greatly helps reducing the risk of heading in the wrong direction for too long a time without knowing either on the customer or on our own side. team. A close relation to the customer thus is an inherent factor of each agile project and therefore a success factor. Complexity in a project results from my point of view during “feedback loops” which can create an unexpected dynamics within the system. In a project, this is generally caused by changing requirements which lead to feedback loops, additional efforts and timely delays. As many of today’s IT projects are under high time pressure and quite often moving targets in terms of requirements, this inevitably leads to higher complexity. Since transparency and inspection, but also more and more adoption are key cornerstones of the agile framework, it has become clear that agile projects can help to better manage raising complexity. What makes a good PM? Skills in PM and methodology but also social and communication competences. A PM at Intersys additionally has to be customer oriented and ser vice driven, which is important when delivering ­i ndividual software. tal archive, Intersys can help you to manage your contracts efficiently and timely. Please enquire for more details. with UBK delivering integration and test management services to round off each resulting ERP project. New customers in 2015/2016 The year 2015 has shown a decent amount of new customers for Intersys. Several projects were implemented to the full satisfaction of our new contacts. Following some examples from our list of new customers: –	A scanner based solution for delivery of news titles for Tamedia, one of the largest media companies in Switzerland. –	Centris AG, a service provider in the health care market was supported with a test automation concept and testing services. –	S itasys AG, a company in the public security space was supported with an application concept. 2016 has also started well with new customers: –	Webshop development for a local meat distributor. –	 Web presence renewal for Weber Werbung. –	New web portal for a local semi-­p ublic company in the insurance space. –	A new test automation project in the IP Telephony space for Swisscom AG. Participate in our new contest! With the help of a little luck, you can win a new Samsung Gear S2 Classic Black smart watch. Participate by scanning the QR-code and filling out the resulting form or visit our website www.intersys.ch/contest. The winner will be drawn from all entries. Contest deadline is 30th Mai 2016. 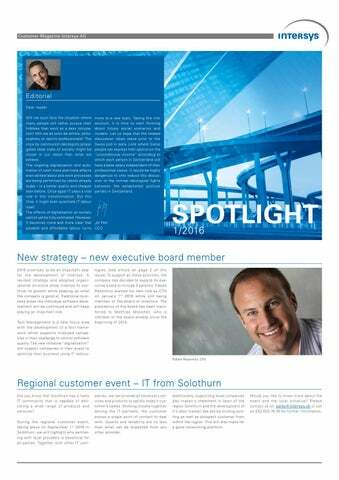 Winner of our last contest The winner of our last Spotlight contest (2/15) is Manfred Schild. Mr. Schild is heading the grid application department within the national Swiss Powerline ­o perator Swissgrid in Laufenburg. He did win an Apple Watch of the newest generation which he received at the Intersys headquarter in Zuchwil. Please see below for the new contest. Contest contest. Only one entry per person. There is no legal recourse after the prize draw. The prize draw is excluded from the jurisdiction of any court. The winner will be notified in writing by eMail and/or letter. There is no cash alternative to the prize. The prize is not transferable to another person. Information entered by the participants can be used by Intersys for advertising purposes, however, they will not be passed on to third parties. 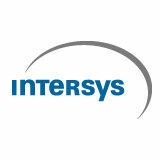 Employees of Intersys AG and Business4you AG are excluded from the contest. The contest will close on 30th Mai 2016.